The Ford Fiesta ST has shown itself as a concept at various motor shows over the past year but some details about the upcoming production version have surfaced – indicating that this sporty subcompact hatchback should be a ton of fun to drive when it arrives next year. Ford Motor Company hasn’t offered any official word on the production ready 2014 Ford Fiesta ST but the guys over at Autoblog have gotten their hands on some leaked documents that give us a good idea of what to expect when the Fiesta ST does arrive. First and foremost, the jewel of the 2014 Ford Fiesta ST is the 1.6L EcoBoost 4-cylinder, packing a single turbocharger that helps this diminutive engine pump out 180 horsepower and 177lb-ft of torque while an overboost mode that stretches the torque band a bit. This new EcoBoost engine option should make the ST package a tremendous deal more exciting to drive than the standard 1.6L Duratec engine that offers just 120 horsepower and 112lb-ft of torque. This powerful little EcoBoost’d mill is mated to a 6-speed manual transmission featuring a torque vectoring system to help make the most of that power while a 3 mode stability control system should allow a nice variance of electronic support for those who want it – and those who do not. We can expect that the Fiesta ST EcoBoost engine will be fitted with a dual exhaust setup that should provide a little grumble under acceleration. On the outside, the 2014 Ford Fiesta ST will likely look a great deal like the concept version that debuted at the 2011 LA Auto Show while also appearing this past January in Detroit – a design that also appears to be shared with the loosely camouflaged mules caught in spy shots over the past few months. Overall, the Fiesta ST Concept wore similar design cues to the high performance Ford Focus ST, with a large trapezoidal upper grille opening and a lower opening the spans a great deal of the front end – both of which allow plenty of air to flow through the radiator and intercooler. The front end will also feature headlights with black bezels along with fog lights mounted low and towards the outside of the front fascia, also in black enclosures. Along the side, the 2014 Ford Fiesta ST 5-door should feature side skirts that give this sporty hatchback a more aggressive look, especially when combined with the 5-spoke 17” wheels and sport tuned suspension. The side profile also benefits from black painted pillars for a more fluid greenhouse design with mirror caps painted to match the body color. The Fiesta ST should be offered in seven exterior choices: Molten Orange Metallic (shown in the gallery on the right), Ingot Silver Metallic, Green Envy Metallic, Oxford White, Performance Blue, Race Red or Tuxedo Black Metallic. Out back, the 2014 Fiesta ST will feature a prominent spoiler mounted high on the hatch, essentially extending the roofline a few more inches while an ultra aggressive lower rear fascia that wraps around the dual exhaust with both a portion in the matching body color and a gloss black filler section. 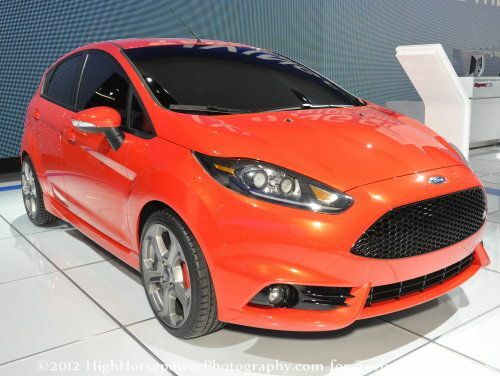 Finally, the ST logo will likely appear on the hatch – just like the Fiesta ST Concept shown above. Ford has not offered any time frame as to when the 2014 Fiesta ST will debut in production form or when it will arrive in dealerships. However, the Fiesta ST Concept debuted last year at the LA Auto Show so there is a good chance that LA will also host the debut of the production model. If the Fiesta ST does not debut in LA, then Detroit seems like the best bet next January. The 2014 Ford Fiesta ST is expected to arrive sometime in 2013 and considering the sporty nature, I would guess that it would arrive in time for summer. We can expect more on that, including the price once the car makes its formal public debut…although there is no indication right now as to when that might be.